Highways Agency traffic officers will provide winter driving advice at motorway service stations across England as part of Operation Showtime this weekend. Traffic officers will have factsheets and posters to hand out, including advice about driving in adverse weather, planning journeys over Christmas, and checking vehicles before driving long distances in winter. Operation Showtime gives the public a chance to learn more about our traffic officers, and speak to them in detail about safe driving on the motorway. Our winter campaign always focuses on the safety of road users – and we encourage anyone driving over the winter period to ensure they, and their vehicle, are fully prepared. The first winter Operation Showtime events will take place on November 15 and 16. 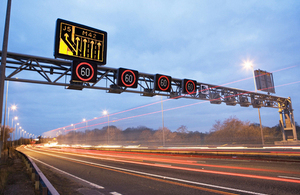 Traffic officers will park up at strategic motorway service areas and will be free to chat to the public who stop by. This will also allow them to still attend incidents if necessary. The traffic officers’ main aim in Operation Showtime is to encourage road users to spend a few minutes preparing for their journey in advance of bad weather this winter. We also recommend checking your vehicle – is the tread depth on your tyres safe? Do your brakes work properly? Is your heating okay? If you are considering a winter service for your vehicle, be sure to get it done at least a week before any long journeys – sadly, there are countless examples of vehicles establishing problems during the very first journey after a check-up. The Highways Agency works closely with the Met Office to ensure it is ready for winter, whatever the weather. Full severe weather plans are in place around the country for snow, hail and ice, as well as heavy rain, flooding and high winds. The Agency encourages all road users to check the latest traffic information and weather forecasts before setting out, and be prepared to alter their plans if weather conditions are particularly bad. It may be a case of leaving earlier, or leaving a little later, or simply planning the best places for rest stops along the way. You can’t have too much information before you set off: and the more you know, the more likely you are to enjoy a smoother journey this winter.